This article introduces and highlights the key findings of the other articles presented in this special issue, which focuses on the employment of beneficiaries in the Social Security Disability Insurance and Supplemental Security Income programs. Using linked administrative data from program and earnings records, we summarize the 2007 employment rates of working-age (18–64) Social Security disability program beneficiaries at the national and state levels, as well as changes in employment since 1996. Substantial variation exists within the population. Disability Insurance beneficiaries and those younger than age 40 were much more likely to work relative to other Social Security beneficiaries. There are also strong regional differences in the employment rates among disability beneficiaries of working age, and these differences are persistent over time. Longitudinal statistics on the employment activities of Social Security Disability Insurance beneficiaries offer a different perspective than the Social Security Administration's published statistics, which are based on annual data, and have important policy implications. This study uses survey and administrative data to analyze the characteristics of working-age Social Security Disability Insurance and Supplemental Security Income beneficiaries who report having work goals or expectations, and the extent to which these beneficiaries become employed and leave the disability rolls during a 4-year period. The authors use longitudinal Social Security administrative data to produce statistics on the number of Disability Insurance (DI) and Supplemental Security Income (SSI)-only beneficiaries whose cash benefits were first suspended or terminated because of work and on the number of months thereafter that those beneficiaries remained in nonpayment status before their return to the program rolls, attainment of the full retirement age, or death—for each year from 2002 through 2006. We also explore differences by program title (DI versus SSI-only) and by participation in the Ticket to Work program. Finally, we examine outcome payments made on behalf of Ticket to Work participants in months of nonpayment status following suspension or termination because of work. 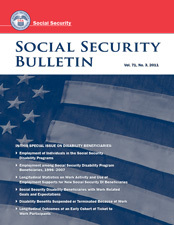 Using data from the 2004–2006 National Beneficiary Surveys matched to Social Security administrative data, this study follows a cohort of disability beneficiaries participating in the Ticket to Work program for several years to assess changes in their service use, health status, employment, and income. The Board of Trustees reports each year on the current and projected financial condition of the Social Security program, which is financed through two separate trust funds: the Old-Age and Survivors Insurance Trust Fund and the Disability Insurance Trust Fund. The introduction, overview, and full report are available here.